SPARTAN STADIUM MSU photo picture art print for sale - MSU Spartan Stadium picture photo poster fine-art photograph print for sale - The 2005 MICHIGAN STATE UNIVERSITY MSU Spartan Stadium Michigan State photo picture art prints for sale - East Lansing, Michigan State picture art photograph poster prints: This fine-art color MSU Spartan Stadium photo picture photograph is made from an ORIGINAL HAND-COLORED BLACK AND WHITE fine-art photograph. This wide angle photograph shows the newly remodeled MSU Spartan Stadium with a packed house full of MSU Spartan football fans. In the foreground we see the MSU Spartan student section and in the background we see the new Press Box and seating stands. This is a very recently released photo made from an original hand-colored black and white photo by noted artist and sports photographer Jan Kaulins. 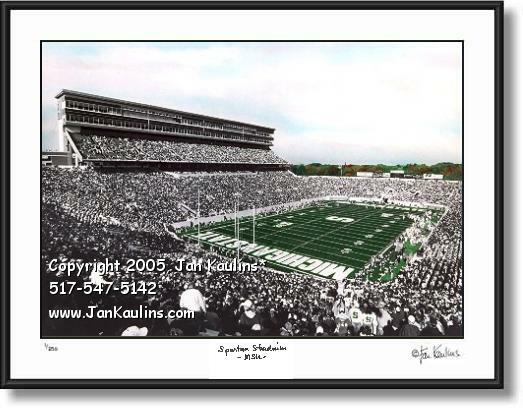 It shows the newly redesigned seating and press box of MSU Michigan State Spartan Stadium in this photo print. TO SEE THE OTHER MSU MICHIGAN STATE SPARTAN STADIUM PHOTOS FOR SALE ON THE MSU SPARTAN STADIUM PHOTO WEBSITE, INCLUDING SPARTAN STADIUM AERIAL PHOTO, AND THIS MICHIGAN STATE UNIVERSITY MSU SPARTAN STADIUM PHOTO WEBSITE JUST CLICK ON THE 'BACK TO MSU SPARTAN STADIUM BACK TO MSU SPARTAN STADIUM PHOTO' LINK JUST ABOVE THIS PHOTO TO TAKE YOU THERE.